In the internal combustion engine application the timing belt/chain connects the crankshaft to the camshaft(s), which in turn controls the opening and closing of the engine's valves. A four-stroke engine requires that the valves open and close once every other revolution of the crankshaft. The timing belt/chain does this. It has teeth to turn the camshaft(s) synchronised with the crankshaft, and is specifically designed for a particular engine. In some engine designs the timing belt may also be used to drive other engine components such as the water pump and oil pump. Gear or chain systems are also used to connect the crankshaft to the camshaft at the correct timing. However, gears and shafts constrain the relative location of the crankshaft and camshafts. Even where the crankshaft and camshaft(s) are very close together, as in pushrod engines, most engine designers use a short chain drive rather than a direct gear drive. This is because gear drives suffer from frequent torque reversal as the cam profiles "kick back" against the drive from the crank, leading to excessive noise and wear. Fibre gears, with more resilience, are preferred to steel gears where direct drive has to be used. Even though the "official" purpose of fiber or nylon gears may be to deal with "kickback", a fiber or nylon cam gear is cheaper to produce. Steel gears almost never fail. The cam lobes wear out long before the gears do. Most large truck and industrial diesel engines have steel gears, and they go 300,000 to 500,000 miles without gears failing. In fact, usually the only time a direct-gear cam drive setup will fail is when the cam gear is nylon or fiber. 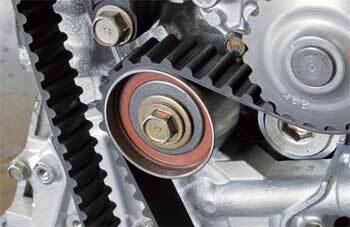 A belt or chain allows much more flexibility in the relative locations of the crankshaft and camshafts. Indicators that the timing chain may need to be replaced include a rattling noise from the front of the engine.